Improve the appearance of your smile with stunning porcelain veneers. Dental veneers are thin, custom-made shells designed to cover the front of teeth to improve the appearance of your smile. They can be made of either porcelain or a resin and the colour can match the natural shade of your teeth. Dental veneers are a great smile makeover option and are often chosen for their immaculate but life like effect. They are placed to correct mal-positioned teeth or poorly formed teeth. They also can close gaps between teeth, mask stained teeth and restore partly broken teeth. Treatment requires a small amount of tooth preparation from the surface of the tooth and patients should be aware that this is irreversible however, the results are stunning and the procedure is quick. 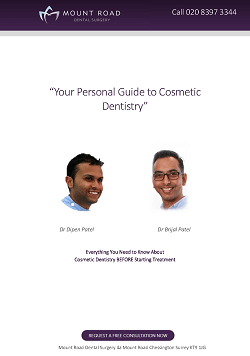 For a more information about your smile makeover book a consultation with our skilled dentists at Mount Road Dental Surgery. Simply call 020 8397 3344 or fill in the form below. Veneers are a form of cosmetic dentistry in which a shell or layer of tooth-colored porcelain or composite is placed over the facial surfaces of your teeth. Veneers can be used by dentists to correct the appearance of worn tooth enamel, uneven tooth alignment or spacing, tooth discoloration, and chips or cracks. In order to place veneers, your dentist will shape and prepare your teeth, this involves permanently changing them by removing a small amount of natural tooth structure (usually only enamel) in order to fit the custom-made porcelain or composite restoration. You then will need to wear temporary veneers until your permanent restorations are ready to be placed. Veneers are esthetically pleasing, protect the surface of damaged teeth and may eliminate the need for more extensive treatments, such as crowns. Other benefits of veneers include durability, an improved appearance to your smile and the need for little-to-no removal of tooth structure, compared to crowns. For more information on Veneers or to book a consultation call us on 020 8397 3344.